With tomatoes in season, this spaghetti with a raw tomato sauce is the epitome of good and simple. Eat it al fresco—it’s like taking an Italian vacation. 1. Place the tomatoes in a large bowl, add the oil, basil, and garlic, and season with salt and pepper. Toss gently, cover, and set aside in a cool place. Then forget about them for about 30 minutes or so to let the flavors mingle. 2. Meanwhile, bring a large pot of salted water to a boil. Cook the spaghetti according to the package directions, until it is tender but al dente, or firm to the bite. Drain the spaghetti. 3. Remove and discard the garlic from the raw tomato sauce. Add the pasta to the sauce, toss, and serve immediately. This spaghetti with raw tomatoes is light, fresh, and simple to make. This is perfect on a hot summer day for a quick and easy dinner. I used store-bought clusters of vine-ripened tomatoes for this dish, which gave a good, sweet tomato flavor. I also shaved a touch of Romano Cheese on top to lend it a little of that nutty flavor. I’ll be keeping my eyes open for heirloom tomatoes to make this again this summer. Make sure to use good-quality olive oil. I initially selected this recipe because I needed something quick and easy to prepare for a weekend dinner. I didn’t have much time to cook, nor did I have time to waste in a grocery store. This recipe is so simple to throw together and requires very little cooking. I could almost say that you’re not really cooking because you’re just throwing noodles in a pot of boiling water then draining them! I loved the flavor of the fresh tomatoes and basil. This was simple enough, and tasty enough, that I’d make this dish over and over again. Next time, I might add shavings of Parmigiano-Reggiano over the top, or maybe some fresh mozzarella as a mix-in. This is a great midweek meal, taking little time to prepare but delivering a light, satisfying dinner. I was concerned that the amount of tomato mixture was too little when compared to the pasta, but the sauce coats the pasta rather than drowns it, and the basil and garlic come through delicately against the sharp tomatoes. While it’s true that the flavours are somewhat subtle, the proportions are just right in the end. I’d never have thought of using raw tomatoes in a sauce, but in this recipe it works perfectly. This spaghetti with raw tomatoes is a fairly simple dish with good flavor. All of the ingredients came through in their own way, like the garlic, which was present but very much in the background. The ingredient amounts were in proportion, though I think I might cut back a little on olive oil next time. I’m not sure if I’d go through the effort to peel the tomatoes again, as I can live with tomato skin in my food. It was lovely, though, to eat pure, fresh tomatoes with no skin or seeds, so the effort did pay off. Combining the hot pasta with the cool tomatoes (which I had to refrigerate to keep cool in the hot weather) yielded a final dish that was lukewarm, which my husband didn’t mind but I found a little odd. Next time, I’ll avoid the refrigerator, even when room temperature is hot. 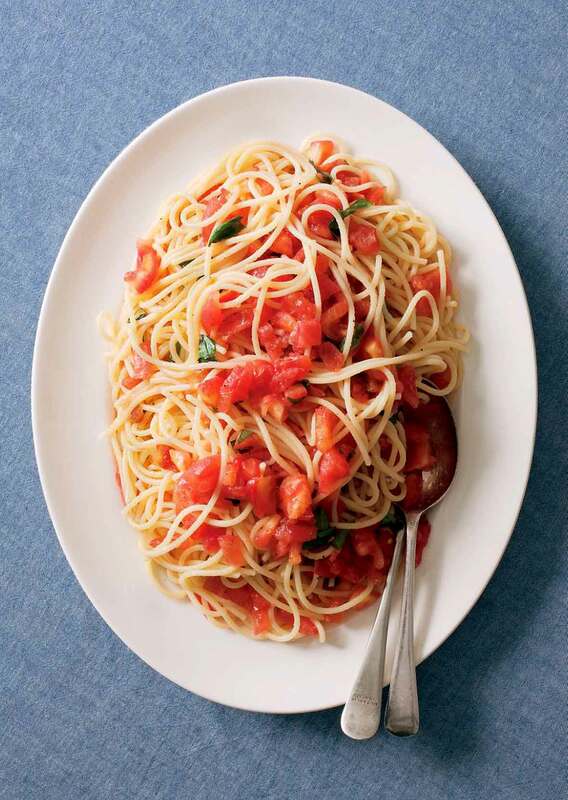 This spaghetti with raw tomatoes is a quick put-together for an easy weeknight meal. I’ve had raw tomato sauce before and enjoyed it very much, as I did this one. The only thing I’d do differently next time is to cut the garlic cloves in half to add a bit more garlic essence to the tomatoes. Just adding them whole didn’t seem to lend much garlicky flavor to the dish. I was skeptical about the small amount of tomato to the amount of spaghetti, but it worked out well. We only got three servings instead of four (good thing hubby isn’t much of a spaghetti eater). This dish was like summer in a bowl, delicious and quite easy to put together (although I have to admit that I generally hate to peel tomatoes). In the future, though, I might at least cut the garlic cloves in half, and possibly add a few more cloves, to really infuse the sauce with the essence of garlic. I served it with a sprinkling of sea salt and some freshly grated Parmesan and found it a perfect summer meal. My husband liked it very much, but loved it much more after he dumped his roasted vegetables on top of it. Another recipe in which success lies in the ingredients you use. Make sure you use the best you can afford, as there are so few components to this dish that each ingredient really does shine through. The only heat required is when cooking the pasta, making this an ideal recipe to quickly whip up for a summer meal. You may be tempted to gild the lily with some cheese or balsamic vinegar, but this dish really doesn’t need it. This simple and delicious recipe is nearly identical to one I’ve been making for a while, but the subtle differences—adding whole garlic cloves and then fishing them out later—are what make this recipe a Testers’ Choice for me. This dish definitely relies on outstanding tomatoes, so if you don’t or can’t grow your own, make sure to pick up some really good ones at a farmers market or store. While the recipe was delicious as-is, I’ve made it twice now and the second time I tried a few changes that I prefer. I thought the original was a little too heavy on the oil and that there wasn’t enough “sauce,” so I doubled the tomatoes, cut the oil in half, and chiffonaded the basil. It was close to perfection for me. I’d suggest following the recipe exactly the first time around and then playing with the proportions to determine what works best for you. The simplicity of the recipe calls out for variation, whether adding some fresh, local mozzarella, or a dusting of lemon zest and white beans to pump up the flavor. Either way, an excellent dish. This dish is perfect for a summer supper, especially when locally grown tomatoes are available. I grow my own "Jersey" tomatoes, have basil in my herb garden, and with pasta, garlic, and good olive oil always in the pantry, I didn't have to go to the stores. The dish is so simple to prepare, and yet the flavors come together beautifully. This recipe could be made with a variety of pasta—linguine, penne, almost anything would work. Better yet, make homemade pasta and I'm certain the dish will be even more wonderful. I really have no changes to suggest other than maybe to slice the garlic to make its flavor is a bit more prominent. Making this pasta sauce didn’t really feel like testing a recipe at all because my own version of this is something that I make a few times a week every summer when I have tomatoes in the garden. You do need to peel the tomatoes, at least if you want to serve the sauce over a long pasta shape, like spaghetti, as suggested here. If you don’t peel the tomatoes, they will stay very chunky. They will work over a short pasta, like penne, but not so well over long strands. The good news is that it doesn’t take long at all to peel them. The most efficient thing to do is to use the same pot and water (before adding salt) that you will later use to boil the pasta. The only thing I’d change when making this recipe is the treatment of the garlic. I like to cut a clove lengthwise, and rub the cut halves on the bowl that I use to mix the sauce. If you do this, it’s not necessary to let the sauce sit for 30 minutes. You can just let it sit for the time it takes to boil the pasta. Tomatoes are the real star here, not garlic. As with any recipe that uses raw ingredients, they must be at the peak of freshness to really shine. The garden freshness of ripened vine tomatoes, along with the fresh basil and garlic, are just made to go together. Olive oil, perhaps one with a bit of a peppery finish, brings the whole, simple preparation to an irresistible finish. Don’t even think about using cheese on this! If you want to take this from great to spectacular, try using a variety of colored heirloom tomatoes. For garlic lovers, just mince the cloves and toss with the tomato mixture before resting in a cool place. This recipe was great—a very light and refreshing option to traditional heavy red sauce on spaghetti. Making the sauce takes about as long as it does to boil the water for pasta! The raw tomatoes would be great without peeling them, as long as the skin isn’t too tough. This dish was a wonderful way to use the cherry tomatoes freshly picked from my garden. 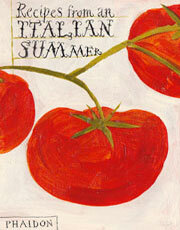 Spaghetti with Raw Tomatoes Recipe © 2010 Editors of Phaidon Press. Photo © 2010 Joel Meyerowitz. All rights reserved. All recipes and photos used with permission of the publisher.